Too Slow! by Dave White © 2011. Photo: Courtesy of the artist. 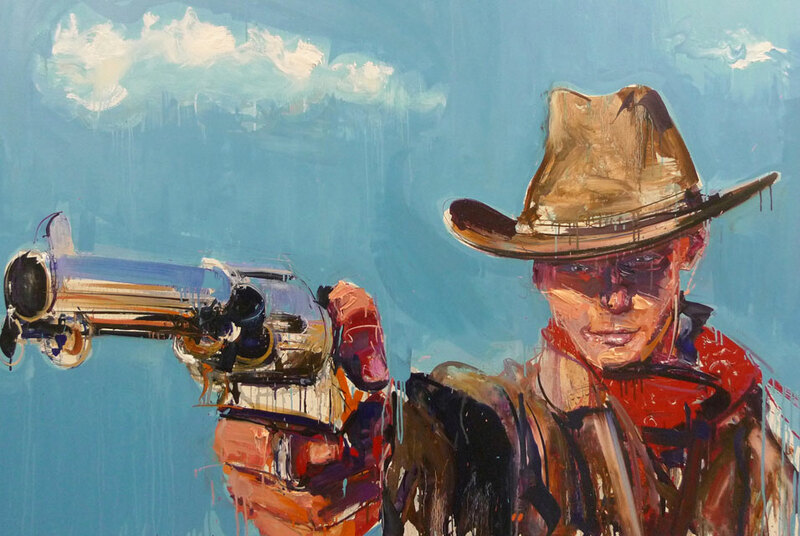 LONDON.- Internationally acclaimed artist Dave White explores American heritage and the spirit of the West in his latest solo show. Entitled Americana, the exhibition will feature a series of large scale oil paintings in Whites trademark expressive style, alongside limited edition prints and works on paper. Taking place at The Coningsby Gallery, London from April 11th through April 30th, 2011, this exhibition highlights Whites ability to capture dynamic scenes with his distinctive impasto style, while presenting a pioneering approach to documenting the legacy of this era. The golden age of the Western movie era is encapsulated in Whites dynamic new series, which could be seen as an innovative interpretation of the classic film still. The cultural inspiration of this period is evident in the apocalyptic themes of battles and stand offs. The turbulence and explosive movements animated and presented through chaotic brushstrokes, and the continuous energy of an artist dedicated to his own battle with the canvas create high energy scenes with intense dramatic tension. The watercolours on paper include a selection of animal works, a subject White explored in his debut exhibition 20 years ago. The first time he has revisited this subject, the animal works are presented with the same dynamism, but a more powerful presence. Whites colourful, vigorously energetic brand of contemporary Pop Art earned him praise from the very inception of his career. His early work, created whilst working in John Lennons old studio, was selected for the Northern Graduates Exhibition which toured UK venues including the Royal College of Art, London. Since then his work has appeared in countless solo and group exhibitions worldwide in Kuala Lumpur, Miami, Barcelona, New York, Tokyo and throughout Europe, featuring alongside artists such as Damien Hirst and David Hockney. Following the London exhibition Americana will tour to Copenhagen in September. Plans are in development for the exhibition to tour to New York. Dave White was born in Liverpool, England in 1971, where he continues to live and work. White is a graduate of Liverpool John Moores University where he was selected for Northern Graduates at the Royal College of Art. Attracting the attention of Lewis Biggs, then Head Curator at Tate Liverpool, at his debut exhibition in 1991, White went on to be awarded Best New Talent in Visual Art at the Daily Post Arts Awards, and has since been short-listed for various prizes. White was recently featured as Artist in the Spotlight for Heidi Lees Editioned Art Magazine in New York. White was one of the first young Western artists to exhibit at the Peoples Square Exhibition Hall in Shanghai, and has since exhibited widely around the world. Last year White exhibited at the New Museum of Contemporary Art in New York on the Project on Creativity with Chuck Close, celebrating AOLs 25th Anniversary. White was also invited to create a live installation at All Things Digital in Los Angeles. Today White is represented by Pop Art galleries Galerie Wild (Zurich and Frankfurt), Die Hamburger Galerie (Hamburg) and Galleri Jules Julian (Copenhagen). Notable collections include Nike, Coca Cola, Rocafella Records, The Silver Family and The Cohen Family. Dave White: Americana is at The Coningsby Gallery, London 11th - 30th April 2011. For more information visit www.davewhiteart.com.